Buy 10 or more for $41.79 each. 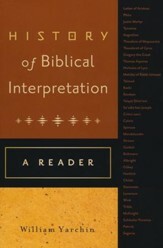 A History of Biblical Interpretation provides detailed and extensive studies of the interpretation of the Scriptures by Jewish and Christian writers throughout the ages. 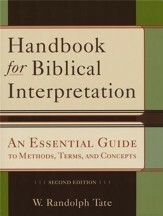 Written by internationally renowned scholars, this multivolume work comprehensively treats the many different methods of interpretation, the important interpreters from various eras, and the key issues that have surfaced repeatedly over the long course of biblical interpretation. This third installment examines the period after the Reformation until the dawn of the twentieth century. Its essays cover broad intellectual and historical movements such as historical criticism, textual criticism, and the quest for the historical Jesus. 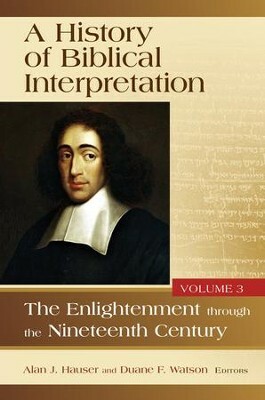 Other contributions focus on particular individuals, including Baruch Spinoza, Friedrich Schleiermacher, and F. C. Baur. Each chapter also includes a helpful bibliography for additional study. Duane F. Watson is professor of New Testament studies at Malone College, Canton, Ohio. He is also the author of Invention, Arrangement, and Style: Rhetorical Criticism of Jude and 2 Peter, editor of Persuasive Artistry: Studies in New Testament Rhetoric, and coauthor of Rhetorical Criticism of the Bible: A Comprehensive Bibliography with Notes on History and Method." Alan J. Hauser is professor of biblical studies at Appalachian State University, Boone, North Carolina. He is also coeditor of Art and Meaning: Rhetoric in Biblical Literature and coauthor of From Carmel to Horeb: Elijah in Crisis and Rhetorical Criticism of the Bible: A Comprehensive Bibliography with Notes on History and Method." "If there has been a single critical period in biblical interpretation during which all paradigms and traditions were challenged and all conclusions shifted, it was surely the Enlightenment and its aftermath. 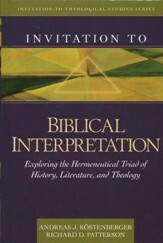 In this history of biblical interpretation from the Enlightenment through the nineteenth century, Alan Hauser and Duane Watson, two veterans in biblical scholarship, have judiciously selected expert scholars to provide a volume that will become the standard text on the rise and enduring power of historical criticismits methods, its scholars, its search for the historical Jesus, its revision of long-held assumptions about biblical authorshipall of which shook the Christian tradition at its foundations. Modern biblical scholarship, the reader will see, is but a development of the Enlightenment's fundamental conclusions." "The great value of this project lies in the combination of focused essays on key figures and issues, with an overarching introduction to the whole period by the editors. 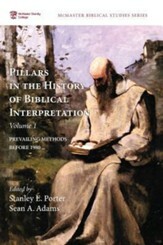 In this third volume, such a format furnishes a well-constructed review of the highly complex but crucial set of intellectual and cultural changes that defined not just modern biblical scholarship but modernity itself, while the essays illustrate the necessity of understanding key figures and themes in their own distinctiveness and integrity. This work will serve both the scholar and the student very well indeed." I'm the author/artist and I want to review A History of Biblical Interpretation: The Enlightenment Through the Nineteenth Century.